FREE SHIP United States This package carries (a)-(b): (a) 2 pieces of 4 1/2" / 115mm Ultra Thick and Ultra Wide segment Diamond Grinding cup wheel for cconcrete stone brick cement (inner hole diamter is 7/8" to 5/8"). (b) 1 Piece of 4-1/2 Inch / 115mm Tuck Point Diamond Blade-.250" Seg. The width allows for fast, efficient removal of mortar joints in brick, block or stone of exterior building surfaces, interior floors and walls, giving you the freedom to repair and resurface almost any type of concrete and masonry. This blade is used for mortar removal, grout repair and cleaning of concrete applications while using an Angle Grinder or Circular Saw. 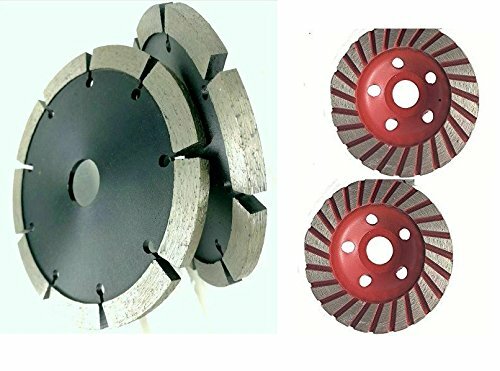 (a) 2 pieces of 4 1/2" / 115mm Ultra Thick and Ultra Wide segment Diamond Grinding cup wheel for cconcrete stone brick cement (inner hole diamter is 7/8" to 5/8"). (b) 1 Piece of 4-1/2 Inch / 115mm Tuck Point Diamond Blade-.250" Seg. The width allows for fast, efficient removal of mortar joints in brick, block or stone of exterior building surfaces, interior floors and walls, giving you the freedom to repair and resurface almost any type of concrete and masonry. This blade is used for mortar removal, grout repair and cleaning of concrete applications while using an Angle Grinder or Circular Saw. If you have any questions about this product by Diamond Abrasive and Power Tools, contact us by completing and submitting the form below. If you are looking for a specif part number, please include it with your message.